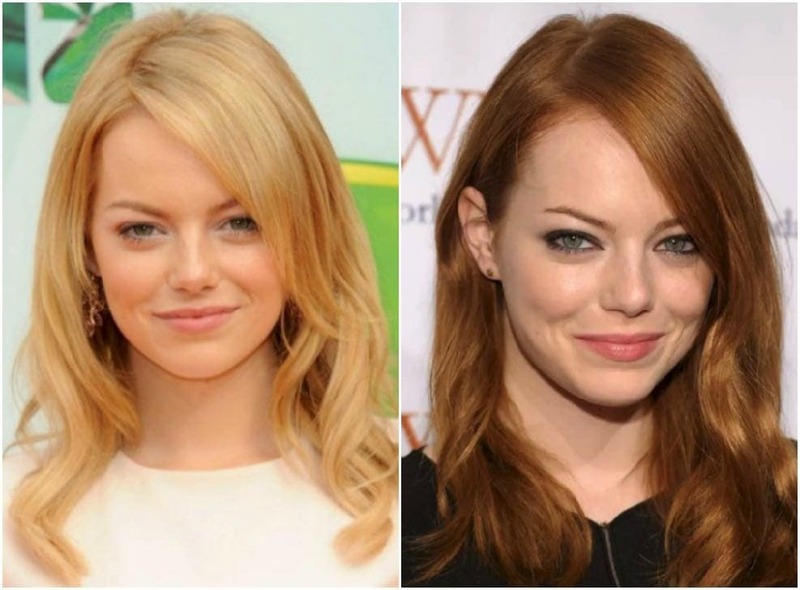 Emma Stone had been a redhead for so long, when she dyed her hair blonde some fans thought she should go back to her “natural” red hair. But the La La Land actress’ real hair color is actually blonde. She pulls off that red hair so beautifully, fans were shocked to find out about her blonde origins. And we have to say, although she looks good as a blonde, having red hair really makes her stand out in the crowd. Kristen Stewart has been rocking many different haircuts in the past few years. But perhaps the one that stuck with her fans the most is the natural-looking brown hair she had during her Twilight days – which is probably the reason why people assume she’s always been a brunette. Although Bella is known for having brown hair, Kristen is actually a natural blonde. Those brown locks definitely gave her a certain edge that fit well with her personality, but we think she looks great either way. Who doesn’t love Jennifer Aniston? She’s an American sweetheart, and has been ever since she took on the part of Rachel in the popular sitcom Friends. Her hair has always drawn much attention, and even became a trend. 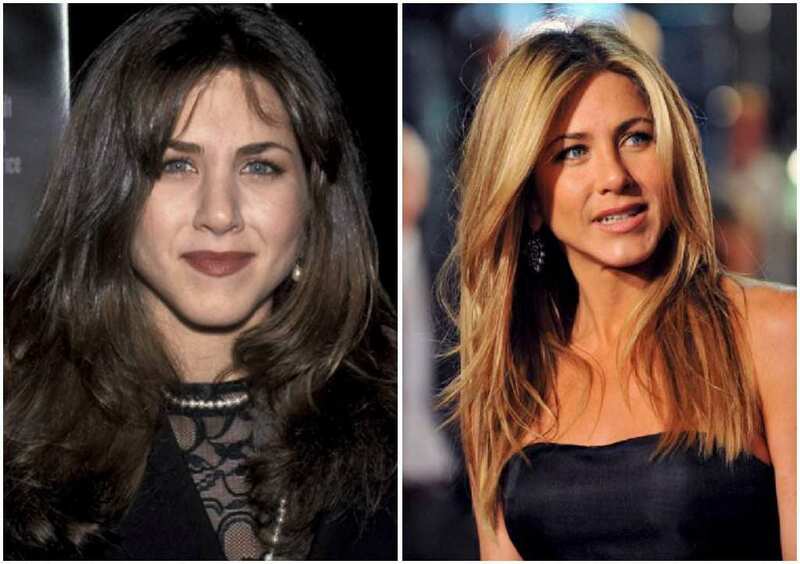 Women everywhere were lining up to get “The Rachel.” But as it turns out, Jennifer isn’t quite as blonde as her fashionable alter-ego Rachel. She’s originally a brunette! Although she’s gorgeous either way, we think being a blonde brings out the best in her. Sophie Turner rose to prominence thanks to her role as Sansa Stark in HBO’s Game of Thrones. 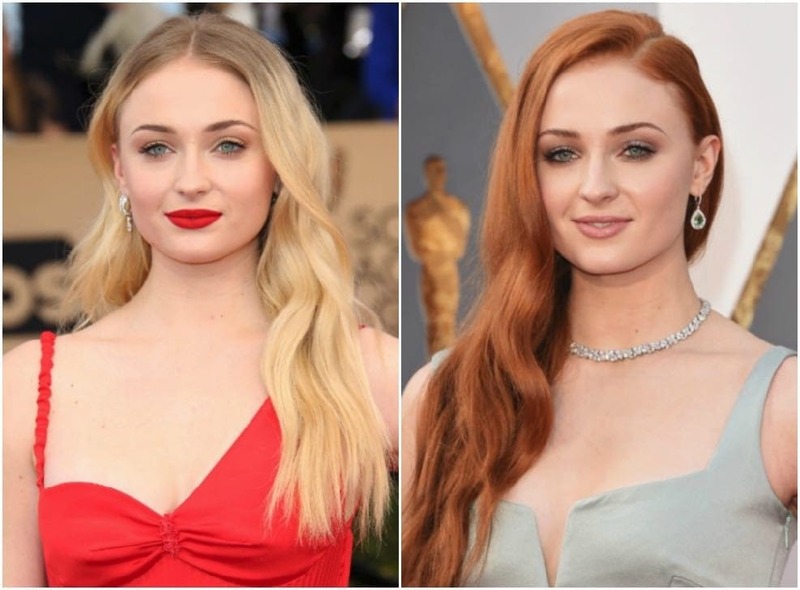 Sansa is quite stubborn and fiery – just like her red hair – but did you know Sophie wasn’t a redhead after all? The originally blonde actress dyed her hair when she was only 13 years old, and described that moment as losing her identity. However, she recently returned to her roots to play a lead role in the film Josie. “With the blond, it’s like I’m back to being Sophie,” she said. Ariana Grande took over the world by storm with hits like Break Free, The Way, and Love Me Harder. 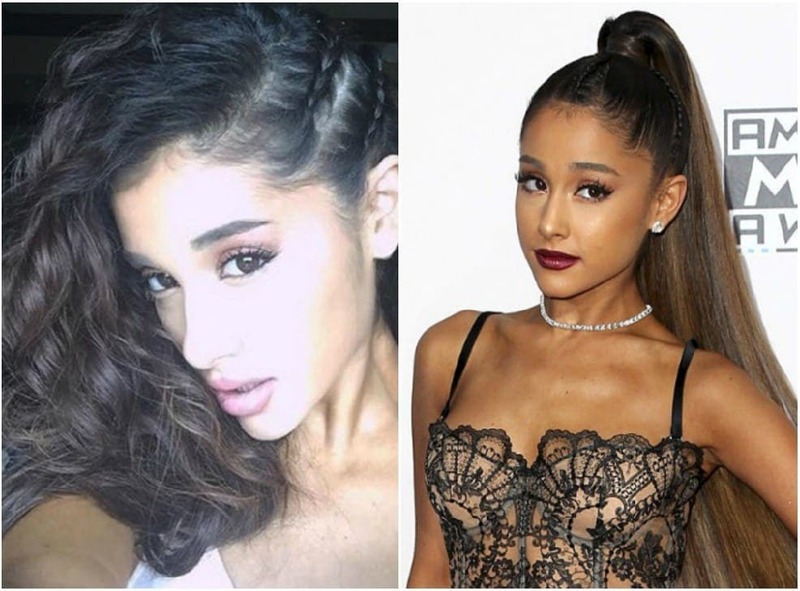 The singer, who recently became engaged to comedian Pete Davidson (to form one of the world’s cutest couples), is pretty much known for her pulled-back pony tail style and extremely long straight hair. But her natural hair is a much more relaxed, curly style, which we totally adore. This girl can do no wrong when it comes to style, but we’d love to see her sporting her natural curls! Amy Adams is one of the most beloved actresses in the world, and her auburn hair is almost an icon. But apparently, the actress isn’t a real redhead, but a blonde. Honestly, we can’t even imagine some of her roles with blonde instead of red hair, which we think suits her perfectly. 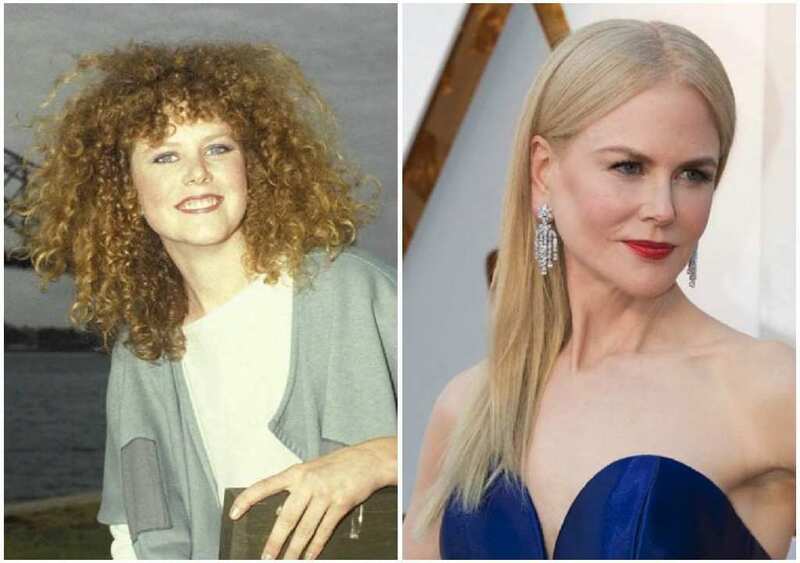 In her recent role as natural-looking Camille in thriller drama Sharp Objects, the hair you see on camera is actually Amy’s natural wavy hair – other than the dye, it isn’t styled at all. We are officially jealous. Emilia is one of the biggest up-and-comers in the business, since she landed the role of fierce ruler Daenerys Targaryen on Game of Thrones. Her character, also known as Khaleesi (and about a million other names), has gorgeous platinum blonde hair – and although the actress is a natural brunette, many fans noted how great she looks in her platinum wig. Emilia has recently decided to go Khaleesi blonde, but ended up regretting it. Apparently, it’s even harder to keep a low profile when she resembles her character more than ever. 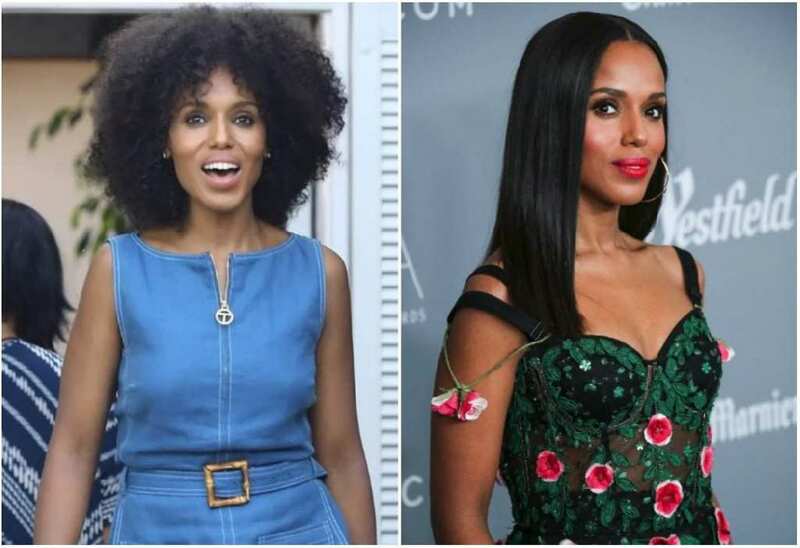 Kerry Washington, who plays the skilled crisis-manager on the show Scandal, has had a head full of curls ever since she was a child. While she’s usually wearing her hair straight or wavy, she recently decided to go back to her natural curls and wear them proudly. “I’d been relaxing my hair since I was a little girl, so part of [going natural] was just wanting to see what would happen if I didn’t,” she said. Apparently, it’s a real time saver. And we have to say she looks incredible! You might remember Leighton Meester as Blair Waldorf, or “Queen B”, New York’s upper east side it-girl. She was often sporting a headband on her brunette hairdo, but have you ever wondered what Leighton’s natural hair really looks like? This beauty is actually a blonde, who looks much more California than New York. Although she wore her brown hair for a long time, she lately went platinum blonde, which completely alters her appearance if you ask us. But there’s no doubt she’d look amazing in any hair color. Red hair might suit Deborah Ann Woll well as the teenaged vampire Jessica in True Blood, but it isn’t the actress’ natural hair color. The actress – who plays Karen Page in Marvel shows like Daredevil, The Punisher, and The Defenders – is now back to her blonde origins. Which look suits her better, we’ll leave that up to you to decide. We’re too busy looking at those big, blue eyes. Anyway you look at it, this woman is stunning. Nicole Kidman is one of the most highly-regarded actors in Hollywood. She’s had many hair colors over the years, and hairstyles to fit each one of the roles she played. But the one that stuck the most with her fans, is her fiery red hair. Although she’s a blonde now, she’s actually a natural redhead, and her hair isn’t quite as straight as it is on the red carpet. It’s actually pretty curly and spunky, and we love it. Dakota is a talented actress who, in recent years, rose to fame thanks to her role as Anastasia Steele in the romance novel turned film, Fifty Shades of Grey. Since Fifty Shades began as Twilight fan-fiction, the main character had brown hair, just like Bella Swan. But in reality, Dakota is as blonde as it gets. We have to admit, though, that dark brown hair suits the actress even better than her original blonde locks. We can’t even imagine True Blood’s lead character, Sookie, as anything else but a blonde. 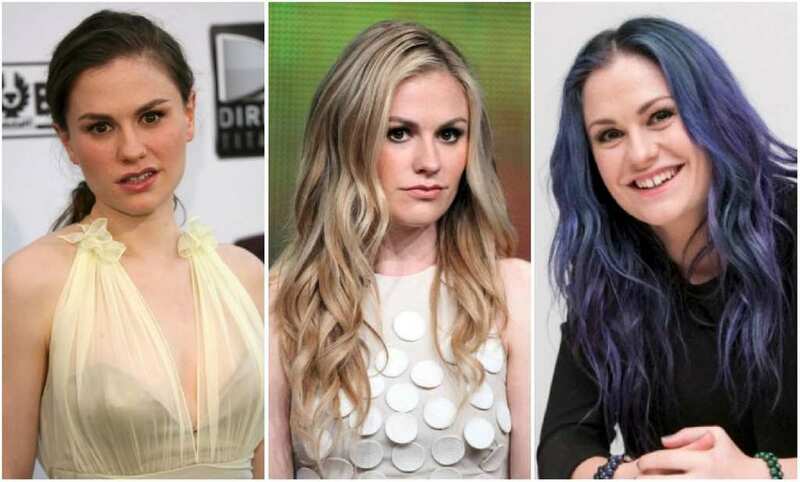 And actress Anna Paquin, who played the fierce waitress, had also been a blonde for most of her adult life. She began as a child actress, won an Oscar at the age of only 11, and has since kept growing her acting career. Originally, she used to have brown hair, and has recently returned to her darker roots, along with some pretty cool colors she added to her style. Oh, Mandy. Who doesn’t love Mandy Moore? The singer and actress entered our lives in the late ’90s, and recently made a comeback in the tear-jerking drama This Is Us. While she’s been a brunette for years now, you might recall she used to have beautiful blonde locks. While the golden color makes her seem like quite the bombshell, the brown hair makes her seem more mature and grown up. Either way, she looks absolutely gorgeous. Olivia Wilde became famous when she was cast to play Thirteen (Dr. Remy Hadley) in the medical drama House. The star has colored her hair brown for years, when originally she’s got reddish-blonde hair. And her hair wasn’t the only thing she changed – she was actually born as Olivia Jane Cockburn, and not Wilde. And although both hair colors suit her perfectly, she recently opted to return to those blonde origins with a new wavy bob. Lady Gaga is perhaps the greatest master in disguise of our time, who definitely loves to experiment with her looks. With all those different hairstyles, heavy makeup, strange outfits, and crazy accessories, it’s hard to tell which Lady Gaga is the real one. She’s recently gone for a more natural, clean look, but did you know her hair actually used to be black? The famous singer-songwriter looked quite different back in the day, when she was still Stefani Germanotta. We’ve seen Scarlett Johansson go blonde, we’ve seen her as a brunette, and she even sported red hair for a while. This bombshell can probably pull off every hairstyle anyone could have imagined, but we’ve always wondered what her hair looked like originally. Well, it’s a very pretty dark blonde / light brown shade, depends how you look at it. Her recent hairdo is quite short and dark brown, and though we love her in everything (literally everything), we hope this Black Widow grows back those beautiful locks. We’ll start off by saying Zooey Deschanel is completely adorable. It’s pretty much a consensus, really. Just look at that dark, wavy hair, with those bangs and those huge blue eyes. But in reality, Zooey is actually not a brunette. She’s blonde, as you can see in the left picture below, and we’re not sure how we feel about her lighter hair. That brown hair fits much better with her bubbly personality, which doesn’t seem far off than her New Girl character, Jess. Brooklyn Decker is one of the world’s most famous models, known for appearing in the Sports Illustrated swimsuit issues. The model and actress is married to Tennis player Andy Roddick, and while many people believe she’s a natural blonde, get ready to gasp – because she actually has brown hair. This picture from high school shows that although we’re used to seeing her in blonde, she actually dyes her hair. We’re not even sure which style looks better, because she’s a real knock-out in both. Katy Perry is basically a chameleon. She loves playing around with colors, so you often see her sporting pink, blue, and even green hair. When we first got to know the singer, we thought she was a spunky brunette, but as it turns out – she’s as blonde as they come! In her more recent hairstyle, the famous pop star chopped off her locks and dyed her hair platinum blonde. And honestly, we just wish she’d go back to that bubbly pink. Ever since we’ve known Shakira, she’s always had blonde hair with curls or waves in it. Remember that “Whenever, Wherever” music video, where she wowed us with her long locks and those non-lying hips? But as it would seem, her natural hair is actually black, and not quite as curly as we’d thought. It’s no wonder the Colombian singer won’t give up her signature blonde wavy hair, because it just suits her so much more. Meghan Markle, formerly an actress and currently the Duchess of Sussex, is the epitome of fashion and grace. She always dons the most perfect outfits, and has been a inspiration for women all over the world since she began dating Prince Harry. 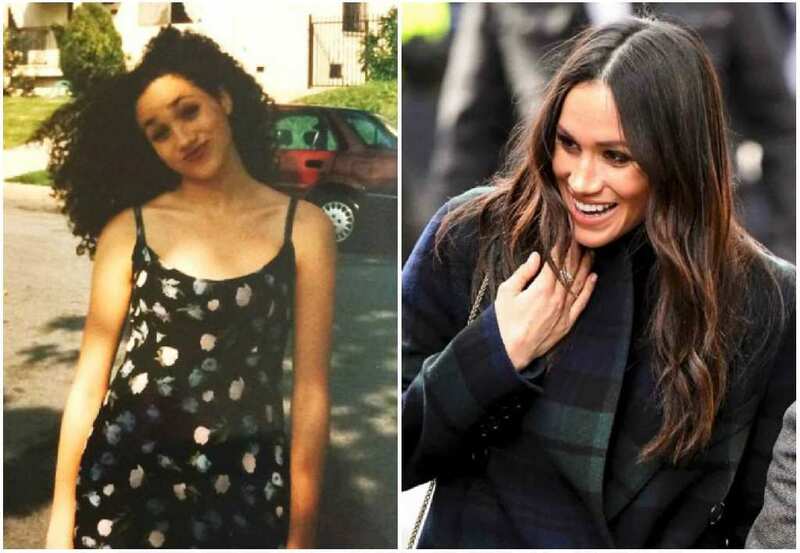 The Duchess, who comes from a diverse family, had said she was never ashamed of her roots – but apparently when it comes down to the roots of her hair, it’s quite a different story. While she styles her hair today, she grew up sporting a head full of lovely curls!